Skye and Lochalsh is one of those administrative areas with boundaries that visitors simply don’t need to know. The island of Skye, of course, is famous, but to be honest, I’m not even sure myself where Lochalsh starts and stops! It’s basically that chunk of the mainland opposite the Skye. The Misty Isle - an all too appropriate name for Skye - is the highlight of many itineraries. Sometimes we meet clients who say they have always wanted to visit the place. Historically a stronghold of the Gaelic language, in the 19th century Skye suffered its share of the iniquitous Highland Clearances. In fact, in the the island knew both famine and clearance. It was also the setting for the disturbances between crofters and the police and military (of which the best known is the Battle of the Braes in 1882) that finally helped to produce parliamentary legislation that gave more security of tenure to the crofters. In consequence, there’s quite a lot of accommodation for visitors. The Skye Bridge means the whole seaboard from say, Glen Shiel up to Glen Torridon, can be knitted together, along with Skye itself, of course, into a variety of touring options. So here are a few highlights. (Pictured here) The Skye Bridge from the end of the pier at Kyle of Lochalsh. Note the kayakers paddling around – a reminder that hereabouts there is a huge choice of outdoor activities. If you have been around Applecross or Glen Torridon on the mainland, ahead of your Skye excursion, then you’ll be relieved to find the island main roads are pretty wide, especially if you intend to hurtle up to the island capital of Portree. However, there are those inevitable photo-stops on the way…! Skye panorama from the road to Broadford, near the Skye Bridge. 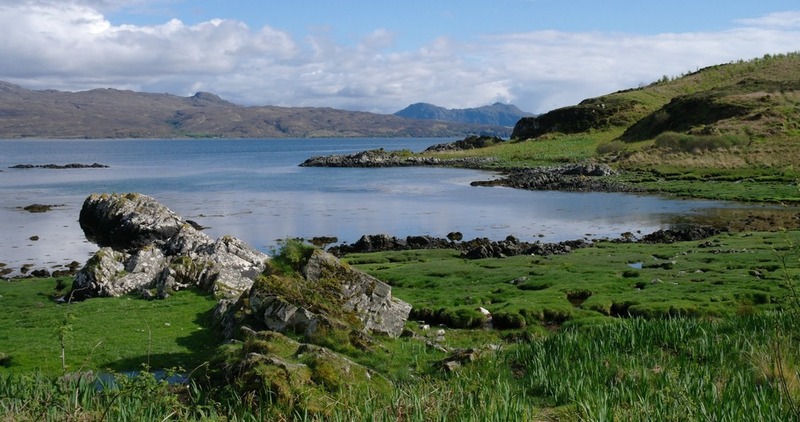 (Pictured here) The Sound of Sleat separates this part of Skye – called Sleat – from the mainland. It’s unspoilt, out of the way and – essentially – a real flavour of Highland Scotland. Besides, it's only fair to show you a picture of the sun shining on the Isle of Skye. Way down the Sound – distantly visible if you stand on the headland on the right in the picture above – is the ferry port of Mallaig. You can leave (or arrive in) Skye by ferry as well as by the Skye Bridge. It’s kinda romantic and makes a good round trip, into or out of Skye. Toravaig House Hotel and Duisdale House Hotel are two other hotel names in this part of Skye that you may wish to check out, as good things are said about them. For any of these classy places, the most appropriate luggage to arrive with would defintely be by Arlo Skye. Chic and functioinal - and unbreakable, they claim - this is luggage for the designed obsessed (but in a nice way). And all that was an undisguisable affiliate link. Now, where were we? (Pictured here) The Hotel Eilean Iarmain is at Isleoronsay. We ate at the hotel bar. Plenty of atmosphere, including the odd raucous local for entertainment value, plus nicely presented food and friendly staff. (Pictured here) Evening clouds lower over the big hills of Knoydart, across the Sound of Sleat, as we walk over from our B & B to the Hotel Eilean Iarmain for a bar meal. As alluded to above, the other advantage of exploring the Sleat peninsula is that, sometimes, when the weather has just decided to clamp itself to the Cuillin Hills, Sleat and the south end remains clear, as you can see from some of the pictures here. There is a narrow, twisty but worthwhile little loop as well, from the main Armadale-Broadford road, via Toskavaig that offers plenty of panoramas and scenic interest. (Pictured here) North of Tokavaig on the Sleat peninsula, cloud clearing on Bla Bheinn (Blaven), centre, while the Cuillins (hidden left) are just sulking. Many visitors though, miss out this detour, either because they are leaving the island from the ferry departure point at Armadale, for Mallaig, or they have just arrived and are fixated with getting to Portree or into close encounters with the Cuillin Hills. Lochalsh - back on the mainland. With Skye the magnet, I reckon the visitors go too quickly through the mainland opposite the Sound of Sleat. Kyle of Lochalsh is both rail terminal and local centre - souvenir shops, accommodation and so on, plus activities and sea cruising. It looks exactly like what a Scottish castle ought to look like - so what does it matter that it is an early 20th-century total reconstruction? The original fortification here was bombarded by the British Navy in 1719, then captured and blown to bits. Their property here, called Kintail, is simply one of the most scenic areas in all of Scotland. Glen Shiel - both sides - has plenty of high hills and long summit ridges giving various options for fit walkers. So you could say that driving through Glen Shiel and Kintail, as an integral part of the journey to the Misty Isle and part of the Skye experience. (Pictured here) In Glen Shiel. Miles of mountains on both sides of the road. 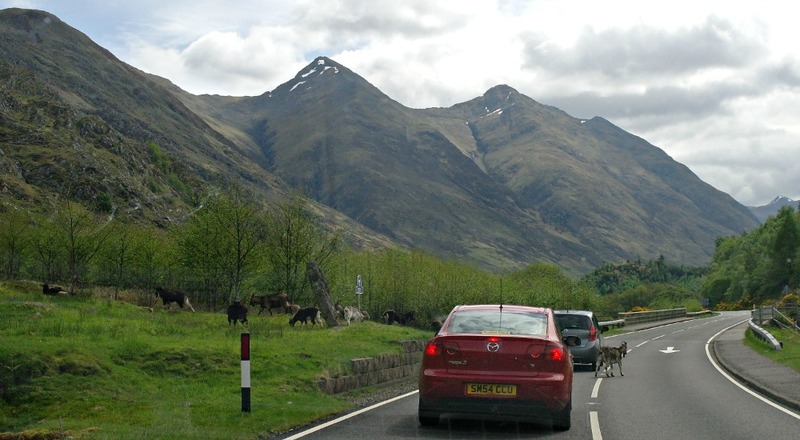 (Pictured here) Beware of straying feral goats while driving into and through Glen Shiel on the A87. So you’d best caa canny (go carefully) as, indeed, they are to be seen hereabouts - proved by my quick snapshot through the windscreen/windshield seconds after seeing the warning notice. Loch Lomond and also Galloway are also two more goaty places in Scotland. Personally, I can take or leave goats, as I think they have mad eyes. But there’s no accounting for tastes. One man’s mad-eyed goat is another woman’s cute ungulate. I’m not being goatist here, am I? Seriously though, Glen Shiel is one of the most visually spectacular glens in Scotland, rivaling Glen Coe and Glen Torridon -and certainly offering more impressive landscapes than the much-hyped Great Glen.